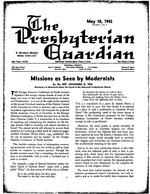 Also available is the entire collection of The Presbyterian Guardian as one PDF Archive (about 990 MB). Right-click on the link and select "Save Link As..."
Please note that this is a very large file and it will take a long time to download based on the speed of your internet connection. It is not recommended that you even attempt to download this file without a high speed internet connection (more than 5Mbps) , as it would take approximately 40 hours to download using a typical dial-up connection. Even with a 1Mbps connection, it will still take about 2 hours to download. Editors of the Guardian during its remarkable 44-year publishing history included H. McAllister Griffiths, J. Gresham Machen, Ned B. Stonehouse, Charles J. Woodbridge, Paul Woolley, Leslie W. Sloat, Robert E. Nicholas, John J. Mitchell, and J. Cameron Fraser. A free, downloadable PDF version of A Cumulative Index to the Presbyterian Guardian, 1935-1979, (offsite link) compiled by James T. Dennison, Jr., has been made available at the website of Kerux (offsite link).